It appears that our car has been dobbing us in – cos it still has a UK number plate and we haven’t yet found our local 87500 black and white pig sticker to put on it. We’ve had a nice British chap come to the door initially in French and introduce himself saying he lives in the next hamlet and offering any help if required. We’ve had a Mercedes driver pause to say hello indicating they lived down the road a bit. We’ve also seen another side, for example the three lads in a car who attracted my attention by shouting “Wayhey!” and offering to do “Any work that needs doing…” They may be fine and skilled trades-men but their marketing department needs to up its game. WARNING – The next few paragraphs may be best avoided by someone of a sensitive disposition. The other day at Lidl which is pronounced differently here and often has a range of nationalities pootling around it we paused to let a woman with a trolley go in first. She smiled but waved us on, well turned out she seemed normal. Lurking behind her was a chap in a shirt and jeans that needed a belt and hitched up – he didn’t look like a devotee of gangsta chic. We were only after a couple of things and meandered around the store without a care in the world. Shirt guy got a call and putting it on speaker started talking loudly in English, with a Yorkshire accent, into his phone five inches in front of his face. Annoying tho that is it gets better/worse. He said they were shopping and they had a trolley each then started detailing some medical position which S and I thought a little unnecessary. After mention of steroids and various things it turned out his comments related to a dog or cat – which was a relief. He then went on to say the other dogs and cat been wormed, cos of “the little white tape worms”. The caller – probably unaware she was broadcasting – said something about being careful with them… Unhindered he went on to say, I quote “I’ve examined my last three stools and could see little white worms”. 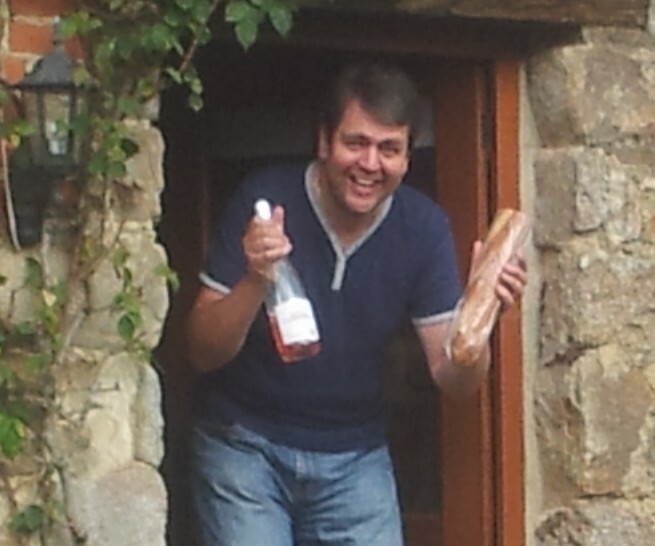 He had moments before spent forty-five seconds fondling baguettes until he chose one. Then announced to most of the shop he had worms! We were – I feel rightly horrified – and I was more than pleased we’d selected bread from a different section. There are sadly many Brits who seem to think that they can speak English (with all accents) – often at the top of their voices – and no-one can even hear them let alone understand them… Clearly behaving in a way that they wouldn’t in the UK. Even if it’s clear that a person speaks English we do our best to always speak French COS WE ARE IN FRANCE. We like it when we complete a process or transaction in French with someone who then responds to the next person in prefect English. Anyone seen or heard similar – feel free to unburden yourselves in the comments. It may like this was be therapeutic!